Pizza is an Italian dish that is worldwide famous. It is a base decorated with colorful veggies and at times chicken/ pork over the layer of spicy and tangy pizza sauce. The sauce used by pizza makers is the crucial thing as it adds the fiery flavor to the pizza. You can make this pizza sauce at home. 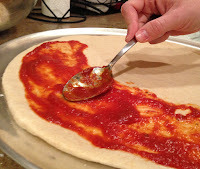 In this post, we will teach you the steps to prepare homemade pizza sauce using few ingredients that include tomato, dehydrated onion powder, garlic powder, basil, oregano, red pepper flakes and olive oil. Grind dried garlic, onion, and basil together and collect it in a small bowl. Make a tomato puree in the grinder and collect it in a medium bowl. Combine water, olive oil, salt, oregano, red pepper flakes, and garlic onion basil powder together. Stir all ingredients well until smooth and well combined. Your homemade pizza sauce is ready to use. What's special in this is that you can also use it as a marinara dipping sauce and enjoy munching chips with it. You can store this sauce in your refrigerator for 5 days. We recommend you making this sauce at least a half hour prior using it for pizza for better flavor. Layer your pizza base with this sauce and spread cheese and veggies all over the pizza. Have any idea to share? Make comments below and share your recipes with us. This article is a part of Bagora Dehydrates. The company is dealing in dried food products, you can avail dehydrated onion products range, dehydrated garlic, dehydrated ginger, and more dried products at competitive rates. The experts supply their products across the world, so there is no boundary line exists, you can order from anywhere and anytime.